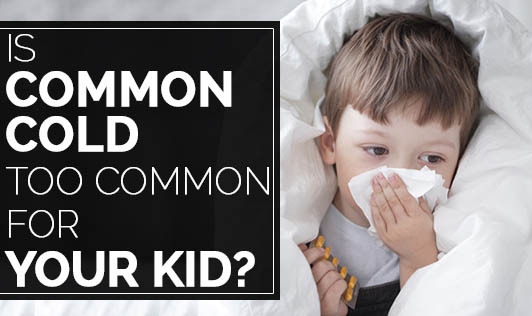 Is Common Cold Too Common For Your Kid? Common cold is the most common illness in children, especially the preschoolers. Children below six years are affected more often and experience prolonged symptoms than adults. Although respiratory viruses last only for a week, the cold symptoms can make children miserable. Cold is a viral infection of the upper respiratory tract. More than 200 different types of viruses contribute to cold. Among these, rhinovirus is the most common culprit. Children under six years of age average up to six to eight episodes of cold per year. Colds in healthy children are not dangerous except in newborns. Colds usually go away in five to ten days without any special treatment. Due to the vast number of viruses that can cause cold, children can never build immunity against all cold viruses. Sometimes, a particular type of cold virus can cause bacterial infection in the lungs, nose, ears or throat. The bacterial infection may weaken the immune system causing fatigue and stress which may need treatment with an antibiotic. With most children, cold begins abruptly with these symptoms. In early stages of cold, your child may be irritable and complain of headache and congestion. Your child may also develop mild cough which could last for several days. With severe cold symptoms, some children may also develop vomiting and diarrhea. The treatment for cold in infants or children is different from that of adults. So, it is very important for parents to know that they should not use any over the counter medications for children without consulting with their medical practitioner. Your doctor would treat the cold symptomatically with safe medications meant for children. At home, parents should encourage the child to eat small meals and drink lots of liquids, as the appetite of the child reduces during colds. Encouraging the child to inhale humidified air can give relief from nasal congestion. A teaspoon of honey at bedtime for kids above one year may be helpful to reduce night time cough. Teach children to wash hands before and after eating and after coughing or sneezing. Use alcohol based hand rubs to disinfect hands if soap and water is not available. These rubs can be repeatedly used without any skin irritation. Parents should try to limit direct contact of kids with ill people. Use effective household cleaners that can kill viruses and reduce viral transmissions.